At New Market Mini Storage, we’re proud to offer a comprehensive array of features created to help you organize and safeguard the things that matter to you. Our onsite team of storage experts leads the way with friendly and professional customer service. We are ready to assist you to select the perfect storage unit and purchase the packing and moving supplies that keep everything neat. With office hours seven days a week, our staff of storage professionals are ready to answer your questions about square footage, helping you to navigate the wide variety of unit sizes and types we offer, to find the specific space that meets your individual needs, whether a standard interior storage space, climate-controlled storage or a drive-up accessible unit. We’ll be happy to provide the answers. At our locally owned and operated facility, when you store inside one of our buildings, you will find a handcart where you need one and wide hallways to easily reach your unit. Be sure to ask about our free truck rental, available for one-time free rental to new renters, at the time of move-in. Once you are settled in and organized, our modern facility streamlines your to-do list with online payments. 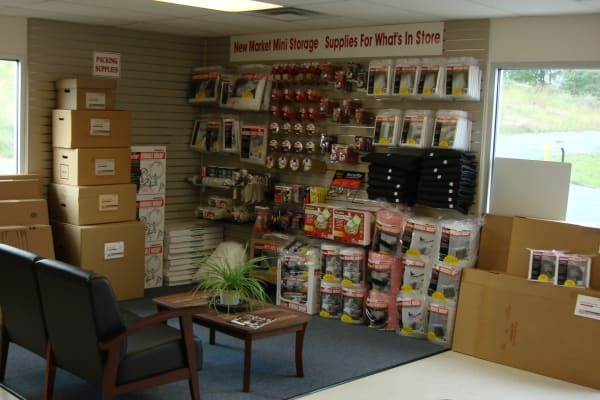 We aim for excellence and ease at New Market Mini Storage. To learn more about our military discounts and current unit availability, contact the storage professionals in our New Market leasing office.